Free first class delivery on orders over £30! 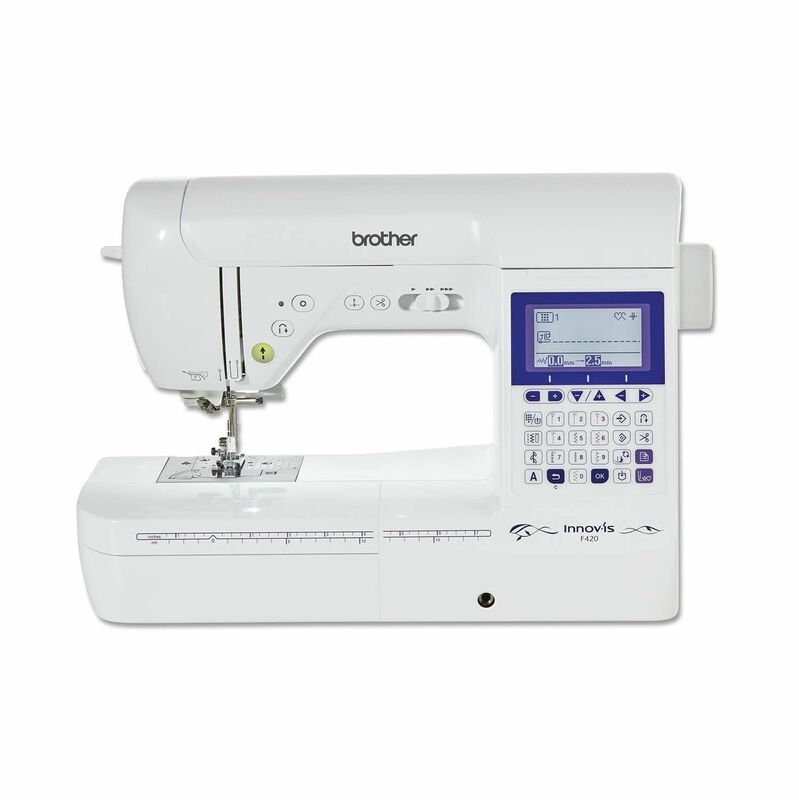 Whether you are a new or more advanced sewer the Brother Innov-is F420 makes sewing a breeze. User-friendly features and automatic needle threading give you more time to do exactly what you love – being creative! With the strong smooth Square Feed Drive System (SFDS) the F420 will handle all types sewing from fashion and homeware, to precision quilting. Choose from numerous stitches built-in the machine, giving you unlimited creativity. Also includes 10 button holes. Combine up to 70 stitch patterns and save them to memory. Choose the required stitch from this useful chart inside the top cover. Design your own stitch patterns or edit and change the built-in template designs and save for future use. All sewing information displayed on a clear, backlit screen. The Innov-is F420 is equipped with a monochrome display. Effortlessly thread the needle by simply lowering the lever. Fast and simple threading make winding bobbins quick and easy. Just drop-in a bobbin and you're ready to sew. Automatically cut upper and lower threads. At the touch of a button, tie-off stitches can be easily sewn at the beginning and end of the stitch. Adjust the sewing speed from slow to fast. This can also be used to adjust the stitch width while sewing. Square Feed Drive System gives you smooth, even feeding action for superior stitch quality on any weight of fabric. Helps you stitch pucker-free seams on even the most stretchy of fabrics. Achieve the best possible stitch quality across different fabrics by adjusting the tension of the upper thread. Innov-is F420 offers manual controls. Ideal for sewing tubular items like sleeves, trouser legs, etc. Free up your hands by using your knee to lift the presser foot. Protects the machine when not in use. • Blind stitch foot "R"
• Button fitting foot "M"
This is a brilliant machine for all types of project work, and I really like for quilting. It is a very sturdy machine, but with the great carry handle it is easy enough to take to classes. I use a trolley for transporting this machine. It is easy to use, with a good range of stitches available, easy bobbin filling and loading and has a brilliant automatic threader. A great range of presser feet comes with this machine, and a good hard cover. This machine compliments my larger Innovis NV1300 machine that I keep in my sewing room. A great machine for the beginner, intermediate and advanced sewer. I really like this machine, easy to use with a good LED screen and excellent over-needle lighting. A slightly longer throat base which is excellent for the quilter. I have the 'sister' machine F440e (embroidery only) and both machines are great workhorses.